It’s a wonderful journey. The cake cutting during Cogzidel Shop launch, is one of my most memorable moment as I waited a long time for this. 2. Tell us some funny moments at Cogzidel you remember over the last one year? Cogzidel has a piggy bank where the employees have to drop 1 Rupee, when they fail to call their colleague with their first name. I was the first one to drop a coin. 3. You work under very strict and stringent timelines. What keeps you motivated to keep hitting the target most of the times? Working with the very strict timeline will improve our efficiency and at the same time it will make our work go live in a timely manner. 4. If you were to describe the skills you picked in the last one year, what would it be? I’ve learnt many things in the past one year I was able to manage the company as HR, developer and a tester. Thanks to Cogzidel for developing my talents in various fields. 5. Do you want to talk about any specific colleague and how have they impacted you? I want to talk about Shiva. When I got my first increment he said that it’s just to motivate me and not for my work. I took it in a positive way and made a goal in my mind that my next increment must be based on my work. I’m very happy now, I got an increment for making the Cogzidel Shop live. 6. What do you want to achieve by the end of this year? Whenever we take an outside project for testing, we fail in completing it, so I want to undertake an outside project and complete it successfully in this year. 7. What is your advice to Cogzidel? What is your advice to those who recently joined or going to be joining? My advice to Cogzidel is, I want them to reduce the overtime and I want my Cogzians to communicate with everyone and work as a team to achieve more in their career. 8. What kind of pressure you have and continue to handle in Cogzidel? How do you handle it? If I get pressure in my work, I will stop working for sometime and get refreshed through someone who is active in the office or I will get some tips from the one who motivates me. (Shiva and Kanmani). 9. You were involved in conferences, events, workshops, interview drives and much more. Do you want to share some of your experience doing it all? I always get an opportunity to go out with our CTO & Director Sam for guest lecture in various colleges, where I have got a lot of knowledge and experience from those sessions. 10. Describe in your words the value Cogzidel adds to its team members? Cogzidel make a team to work with coordination and team spirit. One of the example is my shopping website, where they provided me a team of four members to help me in my work and I would have not completed my task without them. 11. What have you done in Cogzidel and what has Cogzidel done to you? Cogzidel have given me more knowledge about the projects and the field I work in. I have not done much for them rather than this shopping website but I want to do more for my company and I will definitely do it at my best. 12. Here is a space for you to write about specific people in Cogzidel and your funny / interesting experience working with them? Kanmani – I usually make mistakes in sending a mail, she wants me to correct that but I will be repeating it my every mail and she used to tease me with that. 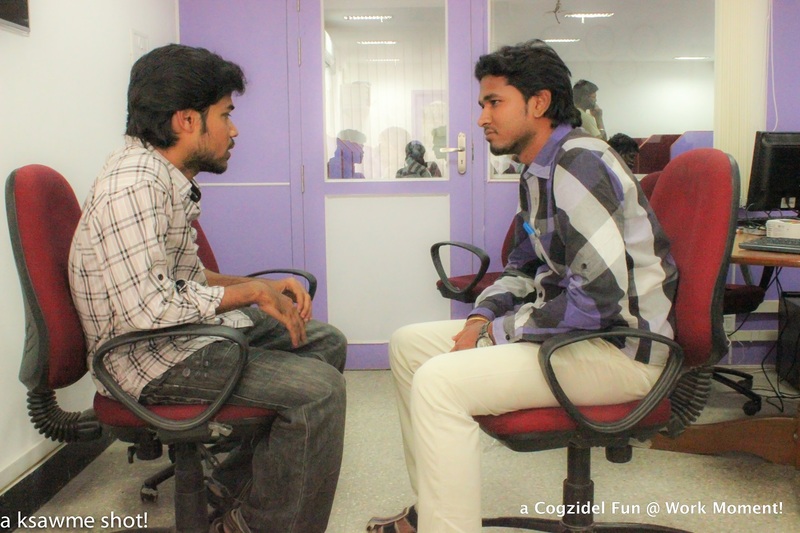 Sasi – Myself and Sasi used to tease our team members during work and we will give them bug if they scold us for that. Previous Entry Operation First Name!